The third episode of the Growing Farms Podcast brings you a quick update into my life starting a farm. I briefly discuss the work that goes into producing the podcast and keeping the website as functional as possible. I have been putting in some serious hours to make sure I bring you the highest quality content. The topic of the episode then turns to our main theme, diversifying your farm income. There are two ways that I have seen this successfully done. Either you take a look around your farm and figure out what business ventures can compliment each other, or you hire other farmers to work for you. I give examples of both, which leads into the interview for this episode. Jesse is an inspirational farmer and businessman. 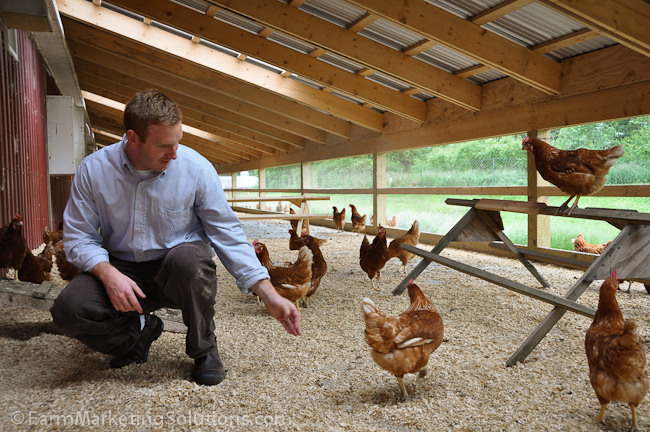 Jesse (and family) own and operate a medium-scale organic egg farm in Monroe, NH. Pete & Gerry's has been in the family for four generations, starting in the late 1800's. They have changed the face of the farm through the years, adapting to meet the needs of the market. Today Pete & Gerry's produces organic, cage-free eggs for sale in grocery markets around New England. Not only do they farm themselves, but they are responsible for keeping 37 other family farmers in business. By defying convention and seeking horizontal integration instead of vertical integration (as most commercial farms do) they have kept more farmers on the land, and provided a better habitat for their hens. I have strict standards on the food I buy at the store. When I cannot get eggs at a farmers' market or from a farmer friend, I buy Pete & Gerry's. Jesse will be the first one to tell you to buy from the farmers' market first, but if you cannot make it, he'll be there to fill the gap. Happy chickens lay better eggs! What else could you be doing to diversify your income? Are you telling your story? Why not? Everyone has a story, and they always think it is boring. Truth is, it's not, and people want to hear it.